It’s time to start making those cards for the special dads in our lives. This sage old moose is colored with Copics. I drew some additional grasses along the bottom to extend the image further across the card. One Father’s Day card in the queue ready for mailing! The coloring is done by hand with Copics. The top of the brown panel has also been hand torn. I don’t have any of the SU colors shown, so I used a variety of greens and browns/tans. I also highlighted with a blue/green /teal marker. Very, very nice moose and nature cad. Love it! Oh, Susan, what a great masculine card! I love this moose with a great layout!! Fabulous! Hugs! impressed that you are already making Father’s Day cards. I have so many card-giving occassion a before then that I will be lucky to get mine done in time. This is such a magnificent masculine card! He looks so majestic there in nature and I’m sure your father will love it. Thanks for sharing this with us at Cards in Envy this week. Take care. A beautiful animal and gorgeous card. I love anything nature related. I looked closely to see your hand-drawn grass, but I can’t distinguish it from the stamped grass. Pretty amazing and fabulous, Susan! Fabulous! What a great Dad card! Awesome masculine card, love the feel of this and the button is so cool with it and I like the torn top, just a great design! 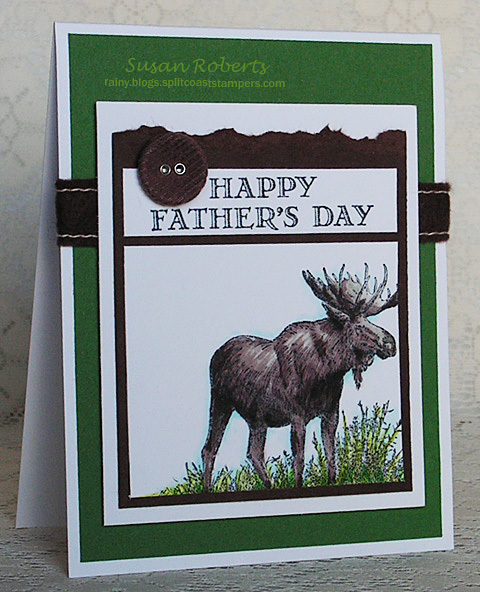 A great Father’s Day design, Susan – thanx for sharing with us at Cardz 4 Guyz this time. Very fine masculine card Susan. You always do a perfect job of coloring! Really stunning masculine design!! Love the coloring of that image and your layout looks fabulous! This is fabulous! 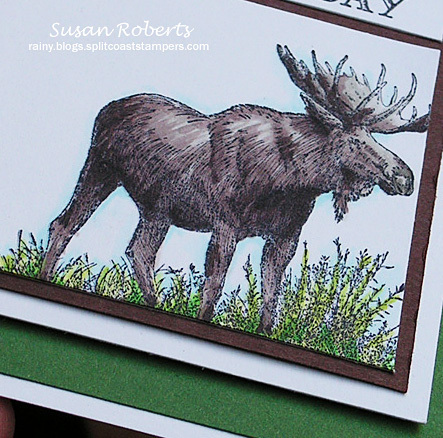 What an amazing moose image and love the design of your card! Thanks for sharing with us at Cards in Envy for our When Nature Calls Challenge! I love how you’ve used all our colours in this great Father’s Day card. Thank you for joining us at TMR. I think this is a gorgeous Father’s Day card, great use of the colours. Thanks so much for playing along with The Male Room this week!